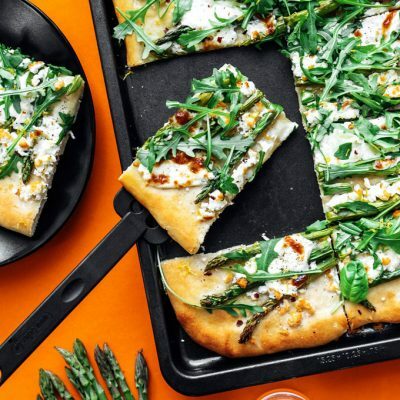 This Asparagus Pizza with burrata and arugula is a simple yet downright delicious flatbread to whip up on pizza night. Creamy burrata piled with tender asparagus, fresh arugula, and lemon! I hadn’t ever tried burrata cheese until just a few weeks ago when tulip-man and I were browsing the *fancy cheese* section of Lidl. But I quickly learned what a massive mistake I’ve been making in not consuming this stuff on the reg because, guys, burrata cheese is LIFE. It’s like if buffalo mozzarella and heavy cream had a baby. So I basically dropped everything to work burrata cheese into an upcoming recipe, and this asparagus pizza was the result! 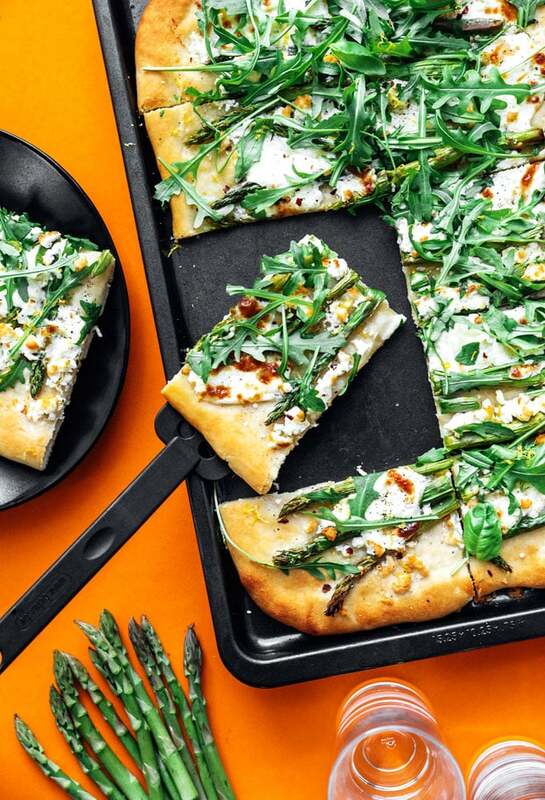 Rather than piling on the sauce, we’re sticking to olive oil and sea salt to lay the base of this pizza, then melting on loads of creamy burrata cheese goodness. Pizza Crust: You can use a store bought crust or make your own crust with this recipe. Asparagus: Roasted asparagus may well be one of the greatest roasted vegetables there ever was. Naturally it combines beautifully with the best cheese ever. Burrata Cheese: You can use fresh mozzarella if you can’t find burrata. 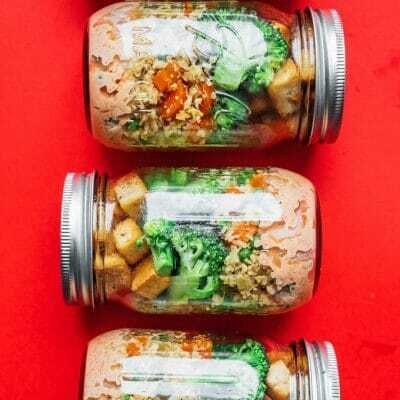 Feta Cheese: Adding a bit of zing with feta, though you could also use goat cheese (or just add more burrata to compensate if you’re not a fan of feta). Arugula & Lemon: We’ll finish it with a handful of fresh arugula and lemon zest to keep this pizza light and fresh! 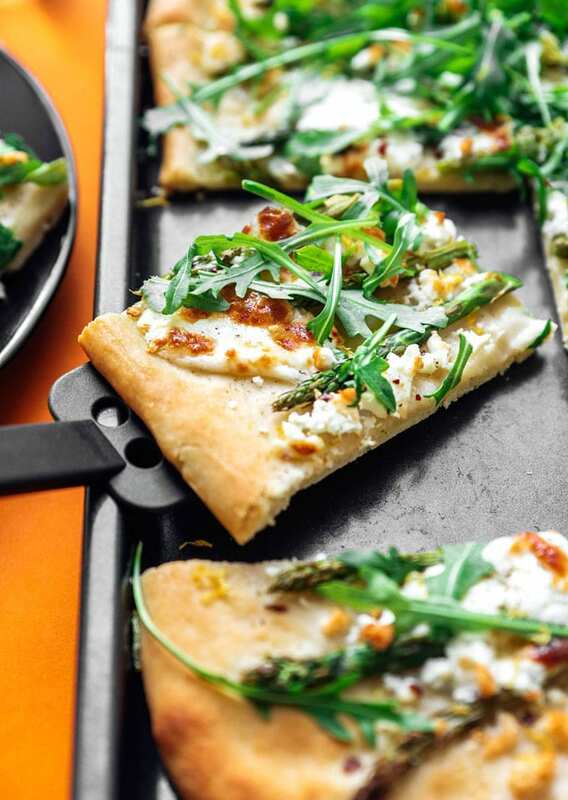 I love simply throwing whole asparagus on the pizza to keep things simple, but you could also shave the asparagus lengthwise with a vegetable peeler (like we did here) to make fun asparagus ribbons. 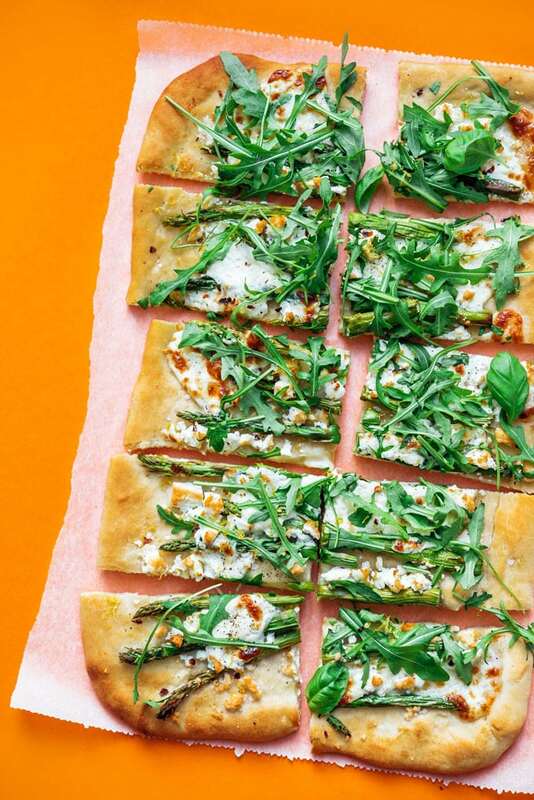 This Burrata Asparagus Pizza is a simple yet downright delicious flatbread to whip up on pizza night. Creamy burrata piled with tender asparagus, fresh arugula, and lemon! Asparagus: Preheat oven to 450 degrees F (230 C). Make or prepare pizza dough, shaping into a rectangular or round shape. 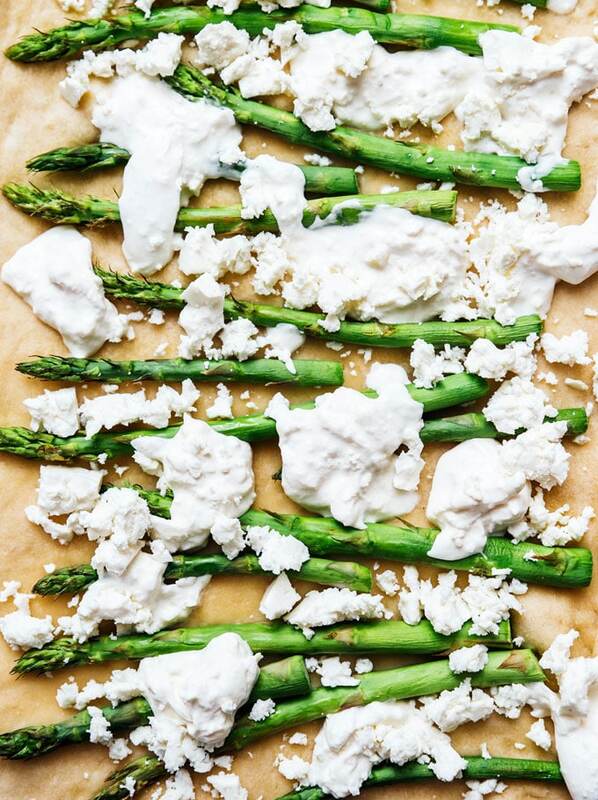 Rub dough with olive oil, then spread asparagus onto the dough in a single layer. Bake for 5 minutes. Cheeses: Remove pizza from oven and add the cheeses. Return to the oven and cook until cheese turns golden, 8 to 10 minutes. 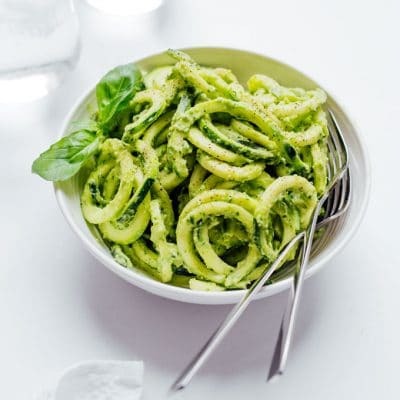 Serve: Top with arugula, lemon zest, salt, and pepper. 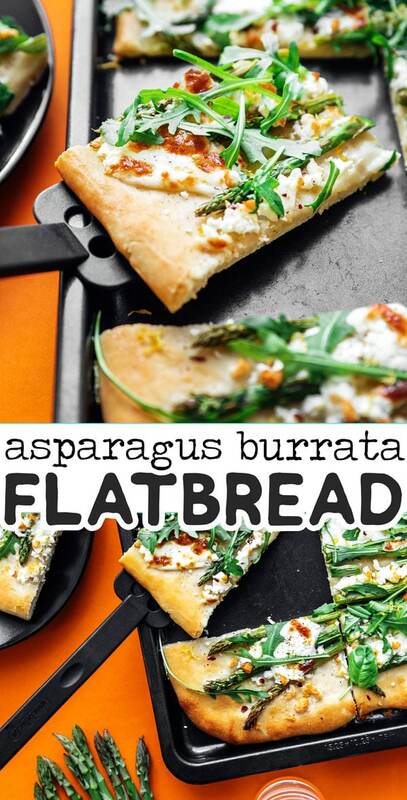 Thanks so much for dropping by and for making easy vegetarian recipes like this Asparagus Pizza possible!